Here are my previous predictions, if you want a little trip down memory lane (ELLO anyone?). 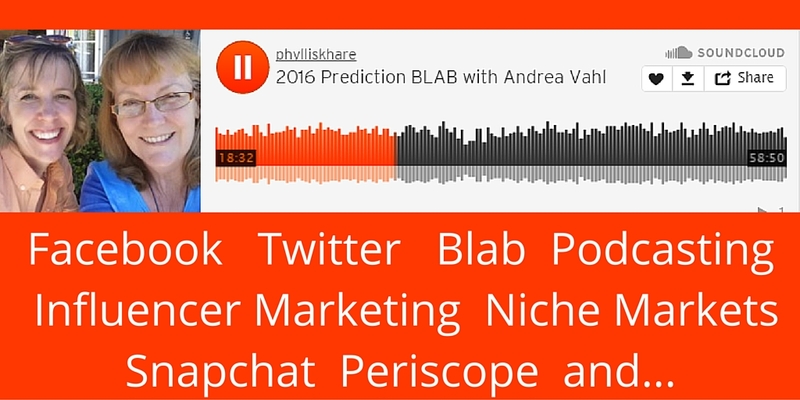 Andrea Vahl and I sat down for blab, this time around, for our predictions. You can read her post about the blab right here. Andrea really expanded our discussion on each of these ideas, and I highly recommend you read through her post noted above. I’d like to dive into this idea: Online Training Isn’t Going Away. I’m kinda banking on it. Andrea and I recently sent out a POLL to everyone on our list and hundreds completed it. And surprise surprise surprise. What the number one way people prefer to get more information about a subject? eBooks. What? Not webinars and blabs and blog posts and podcasts? eBooks. OK. I can do that. One other thing I want to share from that POLL is that people really prefer online training with lifetime access. Well, that’s the reason we designed our Social Media Manager School the way we did. Lifetime access creates lifetime fans. Knowing these two things, and in looking at our predictions, my personal goal for 2016 is to focus on my online training programs. I have so much to share. Enjoy the audio version of our blab – it’s a little experiment into the podcasting arena. Do you like hearing us discuss these types of topics in audio format? Love to hear your impressions. The cool thing about posting a Soundcloud audio, is you can share JUST the audio from within the player above (see that share link?). Or PIN this whole post using the image below. Thanks! See you in 2016!